Guests aboard Zuiderdam, the first in our Vista-class series, enjoy a spectacular art and antique collection, wide teak decks, elegant dining rooms and spacious staterooms-many with verandahs. At the heart of Zuiderdam, suspended in a three-story atrium, is a Waterford Crystal Seahorse. Other notable pieces include a painting of Queen Beatrix by pop culture artist and icon, Andy Warhol, medallions by Frank Lloyd Wright, and a massive floral painting by Charles Ben. Zuiderdam guests enjoy dazzling entertainment options from their very first night on board. As part of the updates coming November 2017, two new music venues will be added: Lincoln Center Stage, featuring world-class musicians performing chamber music, and Billboard Onboard, rocking the house with 50 years of chart-topping hits. These venues will join the already popular B.B. King's Blues Club, which brings the best of Memphis blues to sea, and completes our new "Music Walk" experience. Close your eyes and open your mind to all of the thrill seeking entertainment alternative that you'll have the opportunity to venture. 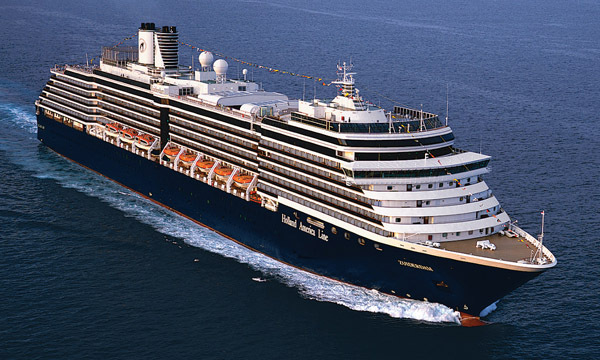 No matter how you plan on spending your night, the Zuiderdam remains well equipped to accommodate each and every one of your desires. If you're looking for the relaxed scenery of a lounge, you'll find plenty. If you're in the mood for the mingling bar atmosphere, you'll feel completely comfortable in our bars.